Walking into his "rockstar" Shakti Kapoor at Terminal 2 of Chhatrapati Shivaji Airport in Mumbai, Yuvraj Singh made sure he lived a memorable fanboy moment. We know no chills on bumping into our crushes and star ideals and Indian cricketer Yuvraj Singh is no different despite the celebrity tag that follows him. 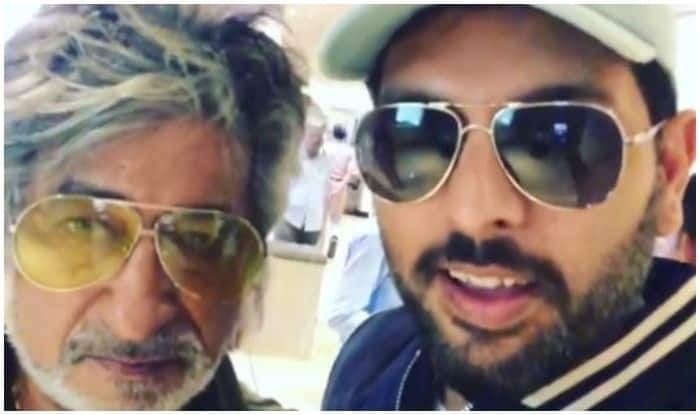 Walking into his “rockstar” Shakti Kapoor at Terminal 2 of Chhatrapati Shivaji Airport in Mumbai, Yuvraj Singh made sure he lived a memorable fanboy moment. Talking to his phone camera, Yuvraj introduced the yesteryear actor as “an all-time rockstar” who had something to say to Yuvi fans and bringing Kapoor into the frame on that note, Yuvi was all smiles as he heard the old man out, praising him and expressing his wish to see the cricketer hit more sixes in future. A visibly embarrased Yuvraj then asked Kapoor to say his iconic dialogue and the latter obliges. Sharing the adorable video on his Instagram handle, Yuvraj captioned it as, “That epic line ! When u get to meet the all time rockstar ! !’ Aooooo lalitaaa @shaktikapoor” (sic). Yuvraj was recently trolled by his former colleague and friend Gautam Gambhir on a post shared from Yuvi’s photoshoot for Vogue magazine. Seeing him pose before a red-coloured vintage car, Gambhir had hilariously commented, “Laal mere dil haal hai, lagta tujhpe kamaal hai, Yuvi shaadi ke baad tera kya haal hai?” On the professional front, Yuvi is gearing up to take part in the upcoming Indian Premier League (IPL) 2019, with Mumbai Indians who bought him for 1 crore rupees base price at the auctions. As for Shakti Kapoor, the actor was recently in news after the death of his legendary actor-friend Kader Khan. Remembering Kader Khan, actor Shakti Kapoor said that the actor-writer was feeling lonely as no one from the film industry visited him when he fell ill. Kapoor, who worked with Khan in more than 100 Hindi films, talked to a daily and recalled the time when the two used to entertain the audience together.